Abstract: Import competition induces firms either to reduce their markup, upgrade their quality, or both. Modern models of international trade typically consider one margin of adjustment to explain the consequences of import competition. However, examining U.S. import data suggests that firms actively respond by adjusting both quality and markup. 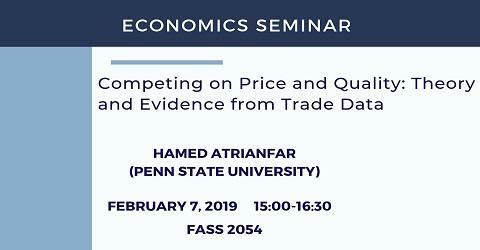 This paper develops and calibrates a Ricardian model of trade which incorporates the endogenous response of quality and markup to import competition. Countries are heterogeneous both in physical efficiency and quality capability. Firms engage in a two-dimensional Bertrand competition in which they simultaneously choose the price and quality of output. Estimation results indicate that developed countries are more productive both in physical and quality production. Moreover, in response to import competition, developed countries mainly upgrade quality, while developing countries mainly reduce the markup. Ignoring the quality channel would underestimate the gains from trade that the U.S. derives with developed countries and overestimate the gains from trade with developing countries. The counterfactual experiment indicates as the U.S. economy grows, it benefits more from free trade with quality-capable countries than with countries which are less capable.